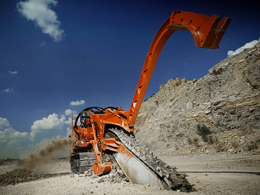 The king of the Ditch Witch mountain is the HT300 track trencher, a rock-digging workhorse capable of trenching up to ten feet deep and up to 36 inches wide in the most extreme jobsite conditions. 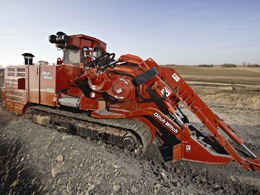 The 300-hp HT300 trencher is designed to deliver maximum trenching power even on rocky and/or uneven terrain, making it the ideal trenching equipment for wind-farm construction, pipeline work, installing and repairing energy-distribution facilities, and other heavy-duty applications. Exclusive flywheel gearbox delivers maximum power to the trenching attachment on demand while minimizing shock to the hydraulic system. Forged, heat-treated, high-alloy steel headshaft is guaranteed for life. Reversible conveyor effectively deposits spoils on either side of the trench.